I was going to come up with a clever tag line for this but the name, for me, the name and the man behind it stand alone. It was a cold Pittsburgh March in 1996 and I was at my first Penguins game without adult supervision. I was lost under the massive steel sky of the Civic Arena with the buzz of being excited and seeing my two favorite hockey teams driving my every step. For some reason I wore my blank New Jersey Devils away sweater (still unsure why) and was gazing longingly at the Penguins 3rd "striped" jersey knowing I couldn't work enough hours at the local pool to ever afford them. I was pulled from my consumerist trance by my friend who reminded me that amongst all this activity there was still a game to watch and, my god, what a game it would be. Things seemed to be amplified that night; ear splitting noise, every play seemed important, and Mario Lemieux was ... well Mario Lemieux. That night he was on another level racking up 7 points against the elite combo of Grant Fuhr and John Casey. He scored 5 goals that night putting everyone into a frenzy. No one sat that night and it felt like a metal show. You couldn't make eye contact with anyone without getting an unsolicited high-five and Lemieux was all over the ice. That video can't even capture a fraction of the excitement that everyone was enjoying that night. The crowd even burst into a spontaneous M-A-R-I-O chant it was sublime. During the excitement I was noticing a small sub-plot that was developing silently as we all celebrated Lemieux's greatness. Tony Twist was destroying the NHL with his educated fists scrapping 14 times that season only losing one close battle (according to hockeyfights.com). Twist was feared and me keeping track of enforcers as a kid watching him mug Francois Leroux earlier that night and not get to fight before the linesmen broke it up. I was in a seat where I could see Twist and Leroux bark frothy threats at eachother each serving two minutes for roughing. As the crowd was watching Glenn Anderon rushing towards Chris Tamer and Bryan Smolinski I was watching Twist and Leroux skating toward eachother. Taking full advantage of the crowd's heightened sense of arousal - this was the climax. It was so loud in the arena no one around me knew that Leroux was kicked out of the game for having taped fists. It was that night that cemented his legend for me. During the rest of the season he had some heavyweight battle and unworldly hits where I maintain to this day that he never was knocked off his feet for his entire Penguins career. The three brief years he was with the Pens he racked up 356 penalty minutes in 165 games.Fighting the who's who of NHL heavyweights endearing himself to the Pittsburgh fans. 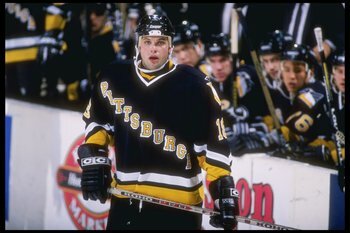 Leroux returned to the Penguins organization in 2002-03 but spent his time with the Baby Penguins, where he posted 124 penalty minutes in 57 games. In 2008 he poked his head into the Wheeling Nailers Club getting 50 PIMs in 28 games. Falling in love Pittsburgh, he has stayed in the area raising his family. Leroux was present for the final game at Mellon Arena last season and also played in the Penguins Alumni Game the day before the 2011 Winter Classic. He is the Vice-President of the Pittsburgh Penguins Alumni Club. *True story, when I found out he was working in real estate I called his number and when he answered I hung up like a little girl. *Also, Francois Leroux's jersey was my very first Penguin's jersey (the 3rd "stripe" jersey) I was given it as an early present so I could wear it to the Kennywood picnic. I wore that sweater in 90 degree weather that day and suffered every moment just so I can wear the name of my favorite player. If I ever find another one during my time on this earth I will buy it no questions asked.